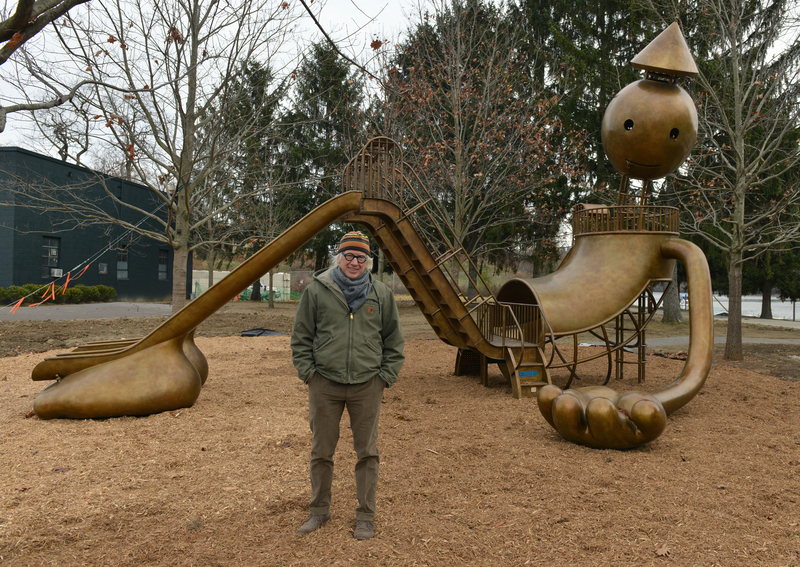 Artist Tom Otterness with his sculpture "Playground" at the Aspinwall Riverfront Park. From venerable museums to public spaces, Pittsburgh has an abundance of art surpassing that of most cities its size. Works that I like to take visitors to see run the gamut from traditional to contemporary, indoors to outside. “Water Lilies” stands out among many fine Impressionist works at Carnegie Museum of Art in Oakland for the way it invites contemplation, the large canvas enveloping the viewer in a visual field that hovers between a realistic scene from nature and an abstract composition of quiet harmonious color. I always see something new as the painting’s planes shift from flat to dimensional in changing gallery light, much as one would standing at the edge of the pond that Monet began to develop adjacent to his original Giverny property in 1890, expanded in 1901, and was still painting at his death in 1926. What I like most about this work is the way it makes us reconsider assumptions as basic as the way we perceive the physical environment. A darkened passage leads to an unlit gallery that is empty except for “Danae,” a large lavender rectangle at the far side that resembles a Minimalist painting but is actually a light work. To say more would spoil the discovery I’ll let you make. Mr. Turrell was not the globally renowned artist he is today when the Mattress Factory museum on the North Side invited him in 1983 to install “Danae,” one of three of his works in the permanent collection. It isn’t often that an artist invites people to climb atop an artwork but New York sculptor Tom Otterness does just that with “Playground,” an elaborate bronze slide set with secret crannies populated by “little people.” Purchased for Aspinwall Riverfront Park by The Grable Foundation, it made its public debut in September. The park property was secured and developed through a grassroots effort and includes other innovatively landscaped areas. While it’s a private, not municipal, park, it’s open to everyone. Few artists are as linked to Pittsburgh as is native son Andy Warhol and visitors always want to see his namesake museum on the North Side. While most people know and love the silkscreened soup cans and celebrity portraits that earned him King of Pop Art fame, I like Warhol’s soup can paintings. Their ragged, often contorted forms are the antithesis of the pristine imagery in his print works and they show that he was investigating contemporary American culture on a number of levels. I never cease to be amazed at the very existence of the murals in the humble, active parish of St. Nicholas Croatian Catholic Church perched on a hill in Millvale overlooking Route 28 — unlikely in their subject and venue, passionate in their commentary and beautifully conceived. This panel is my current favorite but there are so many to admire among the 22 works painted in 1937 and 1941 that speak to the immigrant experience and critique war and privilege. This mural is based on an actual incident, the loss of several sons from one family in a mine accident, as is its complement, “The Croatian Mother Raises Her Sons for War.” For tour days, visit www.vankamurals.org.